As the dystopian nightmare of 2017 fades, to be replaced with fresh, new dystopian horrors with a shiny “Made In 2018” badge on them, we find ourselves looking for a fresh start. And what better way to find a fresh start than turning to a band about to release their fifth album? Well, okay, on the face of it perhaps not the first place you’d look. But you’d be wrong. 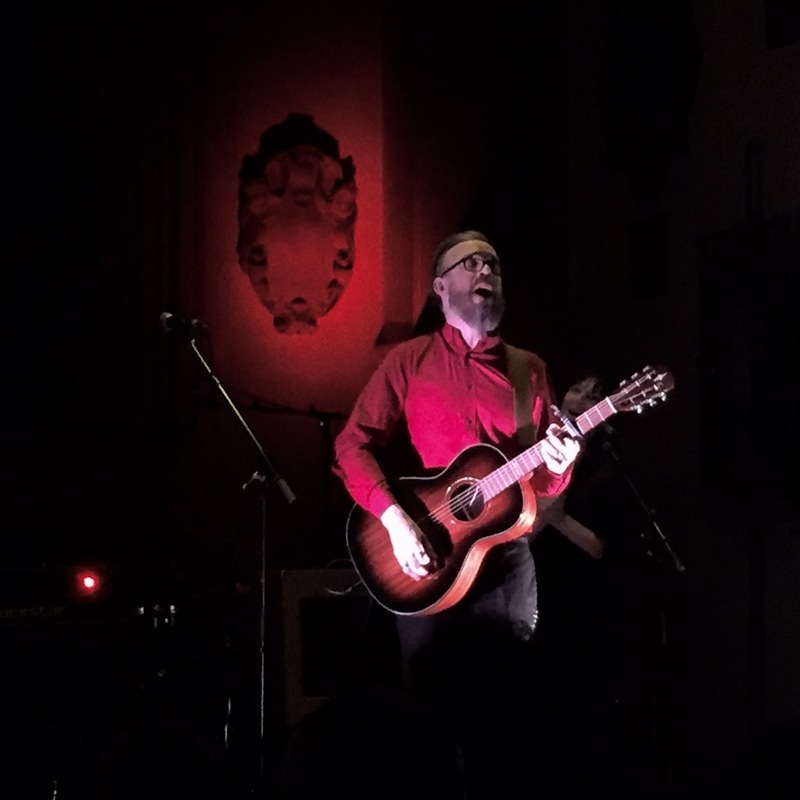 In line with these austere times, Sweet Billy Pilgrim – that indie/art-rock/folk/prog/you-name-it band has itself had a new beginning, paring its line up to the bare essentials of co-vocalists Tim Elsenburg and Jana Carpenter, with Alistair Hamer and Anthony Bishop moving on to new things. They are about to release a fresh new LP called Wapentak, a name derived from a Norse word, literally “Weapon Take”. Those of us well versed in Nordic history will know the er, Norses used to show their allegiances by raising their shields and touching their spear tips as a show of support, and that is an idea Sweet Billy Pilgrim is looking to emulate. “We are asking people to show their allegiance, to at least an idea. To everything that is the opposite of what is happening now.” says Tim. “It’s about the idea of sharing common experiences and how it’s so easy for us to dehumanise each other. To see people who think differently as something “Other” says Jana. “It’s about finding out what we have in common..and how we all feel lonely and abandoned, but we all sleep under the same sky and we all share this world”. “All this talk of walls going up and division. I think that time is long past” adds Tim. Album opener “Asking for a Friend” is a good example. Instead of raging at the injustices of the world it takes the Twitter joke of someone pretending to ask something on behalf of someone else and subverts it. Sweet Billy Pilgrim really are asking for friendship and understanding. 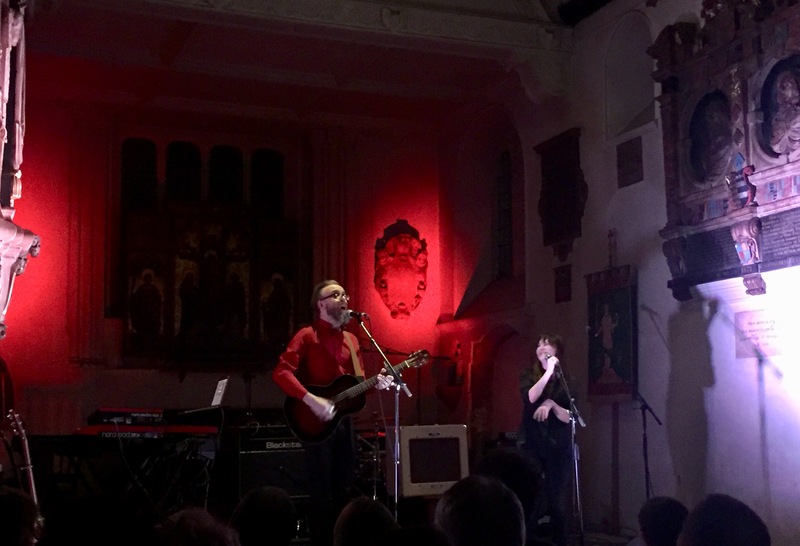 Last night, Tim, Jana and their new band gathered their most loyal tribe of 150 or so Pilgrims to St Pancras Old Church and played to those who pledged allegiance, in this case literally, as the album launch gig was announced via Pledge Music to help fund the making of the album. And what a setting for a gig. St Pancras Old Church is on the cosier and smaller end of ancient churches generally, and is truly Hallowed Ground, for in 1968 The Beatles did visit followed by a crowd of their disciples. 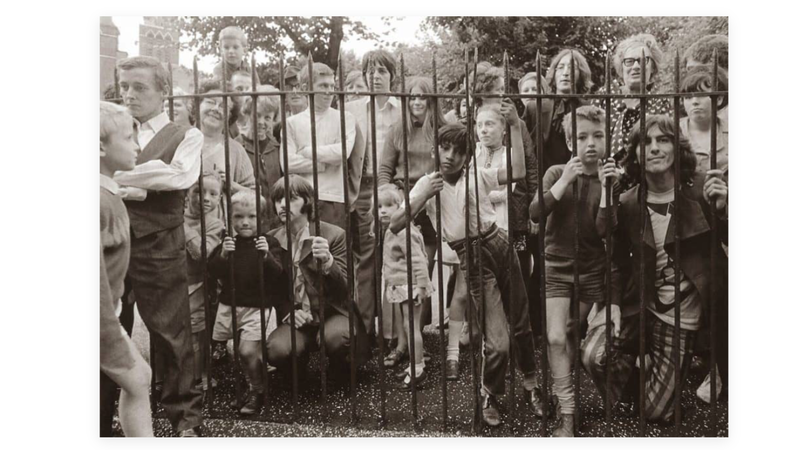 Owners of Beatles Blue/Red best-of LPs will recognise the photos taken behind the railings of the church on that day. It was a perfect, intimate setting for Tim and Jana to showcase the new material and play some old favourites. Tim and Jana are joined by Tim’s son Ethan on “Asking For A Friend” but are mostly unaccompanied for the first half of the show, with two more new songs, “The Briar Bell” and “These Southern Stars” getting their debuts, Tim and Jana’s vocals blending effortlessly. Their singing is truly a wonderful thing. After a brief interval, we have a full band performance. “A Shelter of Reeds” surprises with a low key build up, all slinky piano lines, before jumping into a Penny Lane-era Beatles-esque middle section. Tyrekickers again shows off Tim and Jana’s vocals to the fore and the evening draws to a close with a clever, fun, acoustic guitar version of Peter Gabriel’s Sledgehammer, before “Blue Sky Falls”, the highlight of 2012’s “Crown and Treaty” album, fills St Pancras Church with singing from the band and audience alike. We end the evening feeling we are part of something. Sweet Billy Pilgrim’s Wapentak will be on general release later this year. It’s a thoughtful and mature piece of work, full of great performances, stunning vocals and great songs. In 1968, the year The Beatles last visited St Pancras Old Church, John Lennon called for a non-violent solution to the world’s ills in his song “Revolution”. It feels fitting that fifty years later Sweet Billy Pilgrim should choose this venue to launch their own manifesto to Give Peace A Chance.